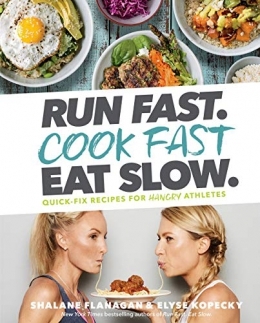 In their second cookbook, Olympian Shalane Flanagan and chef Elyse Kopecky present recipes that are fast and easy without sacrificing flavor. Quickly fix pre-run snacks, post-run recovery breakfasts, on-the-go lunches, and 30-minutes-or-less dinner recipes. Every recipe -- from Shalane and Elyse's signature Superhero muffins to energizing smoothies, grain salads, veggie-loaded power bowls, homemade pizza, and race day bars -- provides fuel and nutrition without sacrificing taste or time. Weiner, Alan (Alan S.), photographer. The Run Fast Eat Slow way -- Jump-start your kitchen -- Rise & run -- Long run brunch -- Lunch pail (& salads) -- Dinner bell (and soups & sides) -- Saucy -- Power snacks (savory) -- Power snacks (sweet) -- Race ready.